A unit of Maharishi Vidyalaya, this residential school focuses on providing world class education to young minds. In line with the vision that “Knowledge is structured in consciousness,” the school has been providing exceptional education through high quality teaching and support staff. With a focus on providing excellence in academics, St. Josheph’s Resedentail School is one of the premier residential schools in Chennai. The school not only focuses on academics but also encourages students to incultcare extra curricular activities to achieve physical and intellectual developments. Part of Apollo Group of colleges, Apollo Priyadarshanam Polytechnic College has been established to impart high quality education. With state-of-the-art infrastructure facilities, the college is committed itself to ensure 100% Personality Development of all its students. One of the most reputed engineering colleges in Chennai, Sri Venkateswara College of Engineering was founded in 1985. With world class amenities and focus on results, the college offers all major courses including computer science, civil, mechanical etc. Looking to dine out? Here is a list of some of the top restaurants in Oragadam. If you are looking for East Asian art and a menu of Japanese and Korean delicacies, Miyabi is the right place to go. The restaurant is known for its excellent ambiance and mouth watering food. Make sure you try their octopus sushi next time you are in the area. One of the most popular coffee joints in India, Café Coffee Day is one of the top hangout spots in Oragadam. Popularly known as CCD, the café has some of the best tasting coffees and deserts. CCD pioneered the concept of cafés in India and first opened a coffee shop in Bangalore in 1996. If you are passing by Oragadam and are looking for quick food, then hotel Crescent Crest should be your go to option. Good and quick service and value for money, the restaurant has good food and ambiance. The city of Chennai has grown on a large scale. With expansion the costs have gone up. Buying a house in the heart of the city or anywhere inside Chennai has become an expensive affair. With outskirts of Chennai also growing at a fast pace and all the facilities available, it has become a conducive and affordable locations to buy a home. Oragadam offers plenty of affordable and attractive real estate projects. Casagrand Arena Phase II: Chennai’s first-ever sports villa community in Oragadam, Arena offers 20 exclusive sports facilities and lifestyle amenities in a calm, pleasant community that has something for every member of your family. 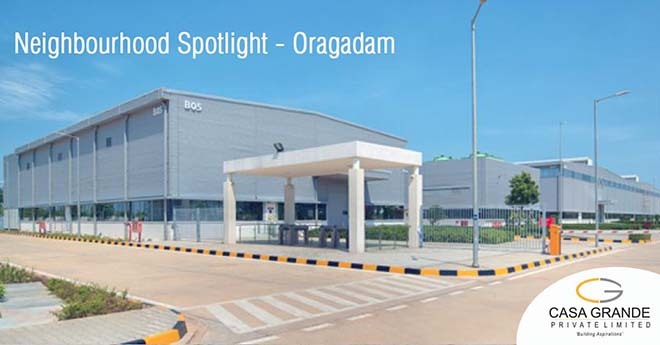 Oragadam is considered as the most developed industrial belt in the city with more than 22 Fortune 500 companies located. Here is a look at a few top companies in the area. One of the leading tyre manufacturing companies in India, Apollo set up its plant in 2008 in Chennai in Oragadam. With a network of over 4000 dealerships in India, the company has recently ventured into the two-wheeler tyre segment as well. The Renault Nissan Automotive India Private Limited has set up a plant in Oragadam with a capacity of producing 400,000 vehicles per year. It is divided equally between Renault India Private Limited and Nissan Motor India Private Limited. Apart from this, the government of Tamil Nadu is also building the Rs. 300 crore Oragadam Industrial Corridor Road, which will further boost the development in the locality.